SAN ELISARIO, TX – Tales of a bygone Spanish colonial era and the gun slinging Wild West echo inside the ancient adobe walls of buildings in this small town half-an-hour drive east of El Paso. Outside one of the ancient structures, now an art gallery, Manuel Alvarado, a tall, slender man happily greets curious visitors. “The reason I like San Eli is because it’s calm, not so hectic like a bigger city,” said Alvarado. San Elizario, or San Eli as it is known to locals, has undergone a change. With the help of local artist Al Borrego, San Elizario has established itself as an art district. Alvarado, a retired Navy serviceman, is just one of many artists whose gallery and studio is housed in one of San Eli’s historic buildings. 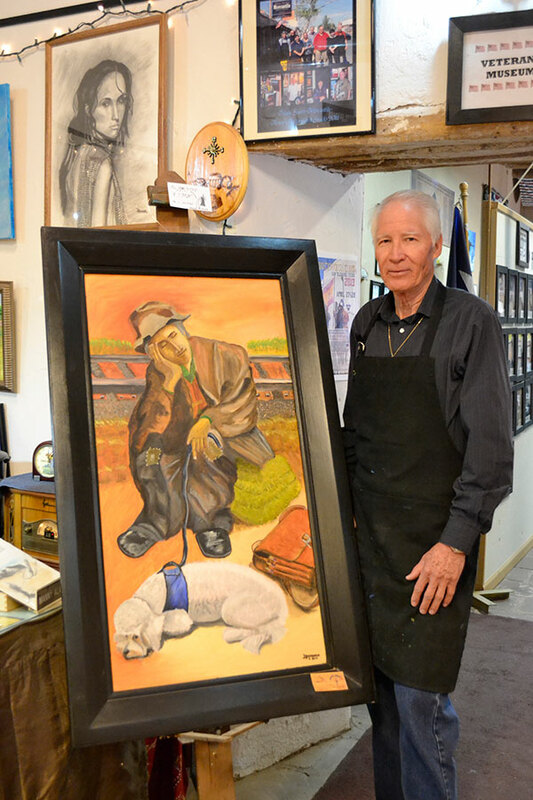 The historic town has drawn many local artists and their studios and galleries to what is now known as the San Elizario Historic Art District. Starting in 2009, the art district has become a must-visit stop on the Mission Trail. The art markets, held every third Sunday of the month, have also attracted many visitors. At the same time, the establishment of the art district has sparked a renewed interest in the history of San Eli. The studios may have given visitors to the historic town a newfound interest, but the history of the town itself is a work of art. The history of San Eli can be dated back to the early 1500’s with the arrival of the Spanish explorers. That event marked the first Thanksgiving, 23 years before the pilgrim’s Thanksgiving at Plymouth Rock. The first Thanksgiving is still celebrated in San Eli through reenactments in an event called the Celebration of Cultures, which is open to the public. “Pretty soon you’re going to start seeing our banners announcing the First Thanksgiving commemoration,” said Daniel Fresquez, vice-president of the Mission Trail Association. The First Thanksgiving is not the only interesting event that has taken place in the historic town. Fans of gunslingers of the old west can find the jail that Billy the Kid famously broke into in San Eli, an event that is frequently reenacted. “Because Billy the Kid had a girlfriend in San Elizario and because his brother in-law was in jail, Billy came up with a scheme to pretend he was a law officer,” explained Fresquez. The art district has renewed the untold history of San Eli. Though the art galleries may be contemporary, their walls are evidence that the history of San Eli is still alive. “We’re rebuilding these beautiful art galleries from the original adobe, 300 year old adobe,” said Fresquez. The old officers quarters and the old walls of the fort for the Presidio, which Fresquez describes as being quite thick, have been recycled and given a new life as art galleries. “The ruins of the officers quarters are still there,” said Fresquez, “and now we’re building it into what we really think is going to be like a second Santa Fe, a Mesilla.” Fresquez hopes to see San Elizario thrive to the point in which both the art district and the historic town become a must-see destination for travelers and tourists. It is this rich history of the buildings and the area that serves as inspiration for Alvarado and his artwork. “The buildings, the way they were made, remind me of where I was born, in a ranch with my grandfather so I feel like I’m in my second home,” said Alvarado.